This poor boy was found out in daylight with horrendous injuries. He was missing an entire front toe right down to the bone. His nose is also damaged. He smelt terribly of infection. This injury is typical of a hedgehog caught in a rat snap trap. The ‘snap’ catches noses and paws. Although these kind of rat traps are perfectly legal, it is not legal to catch anything but rats in them. Small hedgehogs can, however, get inside the traps if they are not sited above ground. Although they do not injure hedgehogs, bait box rat traps can also be lethal to hedgehogs. Hedgehogs can also get inside these traps and will eat any poison left out and be poisoned themselves. Small hedgehogs are around the same size as a rat. This is why it is difficult to keep rats out of hedgehog feeding stations. It is vital to locate traps correctly to avoid catching small hedgehogs. Please watch this video to see how the boxes should be located above ground, out of the reach of hedgehogs. This poor hedgehog was sadly euthanized. When starting to clean the injury, I found it was absolutely full of maggots. Too much damage had been done to save the leg and hedgehogs cannot survive in the wild or captivity with a missing front leg. He was also very weak and emaciated. If he had not had the maggot damage and if he was strong enough for an operation, it might have been possible to stitch the remaining skin around the exposed bone of the toe. It is likely that he was a late Autumn baby who had struggled through winter and was already starving. He may have ventured into a trap looking for food. It is vital to rescue any hedgehog as soon as it is seen out in the day. In the summer, particularly, flies will lay eggs on any open wounds or hedgehogs lying motionless. I then have the problem of maggots to deal with on top of the injuries. It takes many many hours to remove fly eggs and maggots and often you don’t know if, even after all that hard work, the hedgehog will survive. I run a hedgehog rescue in York, England. You can read more about my work here and also how you can support it. 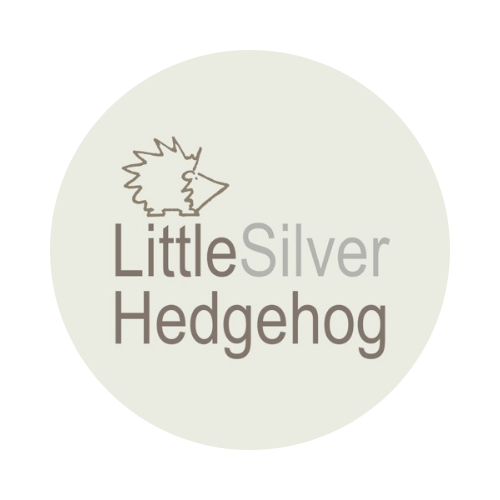 I make handmade silver jewellery inspired by nature and wildlife to raise funds for my rescue work. You can visit my online jewellery shop here. spot on advice. I have had rat traps banned on our allotment site. Poor wee soul. A healthy hedgehog is back living in the garden and so far so good. No sign of any mate for him/her. That’s so sad. Well, at least you tried to save it! Poor baby. Poor little guy has clearly suffered the worst. I like to think that nobody would wish any harm on hedgehogs so it’s a case of making them more aware of the do-s and don’t-s. We’ve accepted that putting food out for hedghogs will inevitably attract other wildlife. If this starts to become a major problem then we may look into humane bait boxes, but our biggest priority is trying to ensure our visiting hedgehogs aren’t arriving to empty feeding stations because it’s all been eaten before they show up.